*Contact us today to discuss half price off our plans for not-for-profit organisations. The premium plan includes 20 sites and offers extended functionality, custom branding, priority support which can be extended as more sites come online. If you're part of a NGO, Social Enterprise or any community organisation, we have a template for you. All templates are built to help you get started. All templates can be easily made into a multi-page site and effortlessly edited to suit your needs. 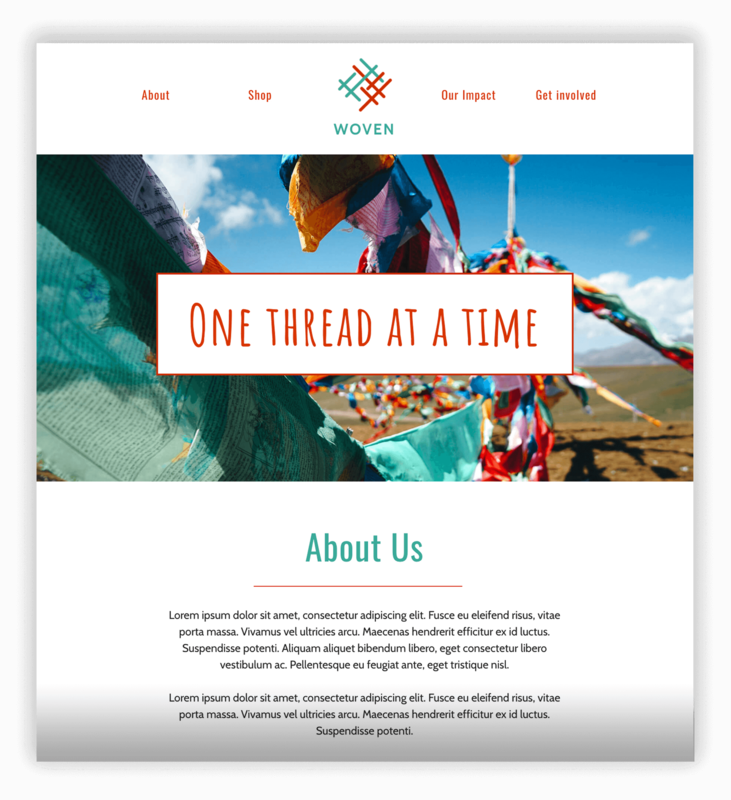 For large organisations who are wanting a more extensive website, this template is for you. Built with non-government organisations in mind, this template provides 'donate' buttons, current campaign pop ups, an interactive map and the latest news updates. 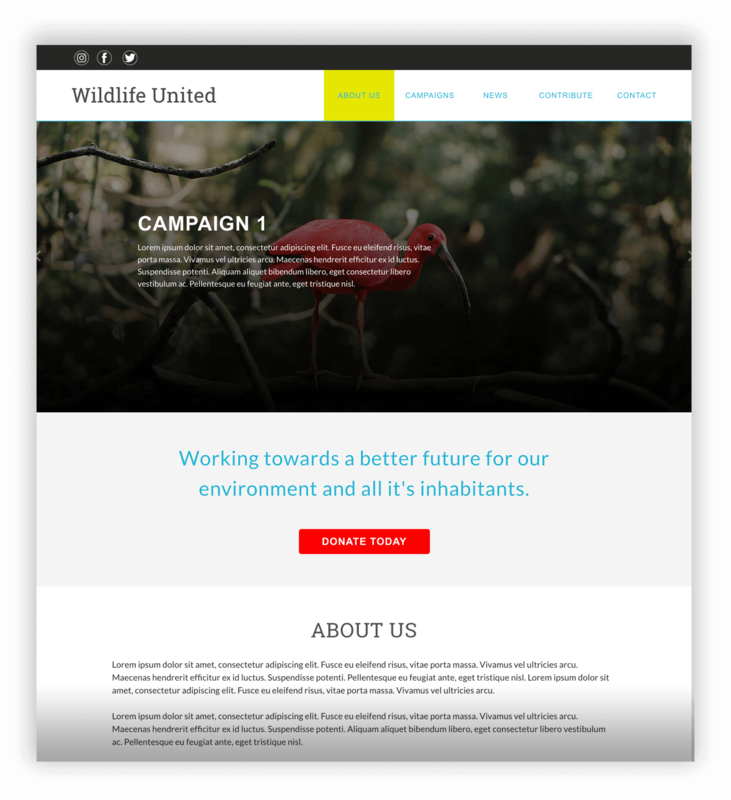 This template provides a clean and simplistic website for organisations or social enterprises that want to incorporate some e-commerce into their page. This template directs visitors to facts, achievements, e-commerce and ways to get involved. 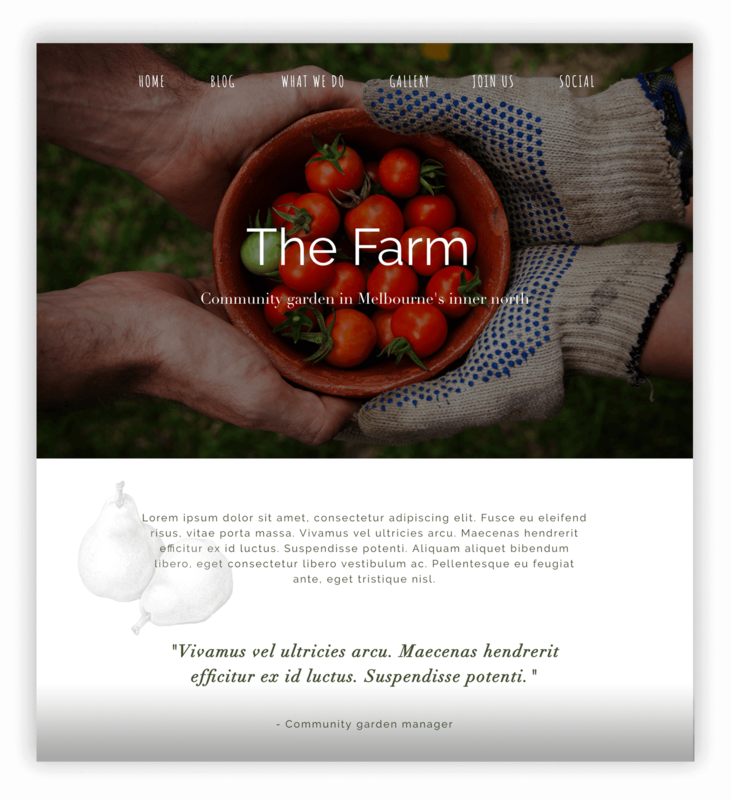 This natural and homely template offers a website for any community organisation or not-for-profit. Consisting of blog posts, an image gallery and social media links, this template will have even a website for a small community project up and running in no time. These templates are simply a starting point to help you begin creating your own website. All templates give you the freedom to add, edit or remove anything you like. Alternatively, you can start with a blank canvas and create your own personal templates, letting your creative skills go wild. Watch this short video to see how it works. Personalise absolutely everything to make it your own. No coding required. Pixel Together helps you design with a drag and drop editor designed for maximum creative freedom and flexibility. All templates are easily editable with no limits to what you can create. Keep it simple and replace the content or use our templates as a starting point to create a unique and standout website. Extend your site by connecting with the all the best tools. Embed subscriptions, videos, audio, maps, event bookings, e-commerce, forms, comments, social sharing and more. Simply drag the HTML widget onto your canvas and replace the code with your programs embeddable code. Connect your own domain name and publish to high speed hosting with one click. All templates have been optimised for SEO to give you the best cafe ranks. Need an export? No problem. Your sites can be exported to clean html/css code at any time. Match your branding guidelines by adding in any custom webfonts from platforms such as Google Fonts, TypeKit, Fonts.com and more. Add touch enabled image galleries and slideshows anywhere into your site so visitors on mobile devices can easily swipe and explore your images. Embed videos from all the major platforms, YouTube, Vimeo or Wistia. Easily resize the video players to suit the mobile, tablet or desktop view. Edit your site from anywhere, anytime. Designing in the browser avoids the need for unnecessary software installations. Our powerful editor gives you access to fully tailor the mobile and tablet experiences to build a site users will love, no matter the device. Website editing and designing has never been so easy. 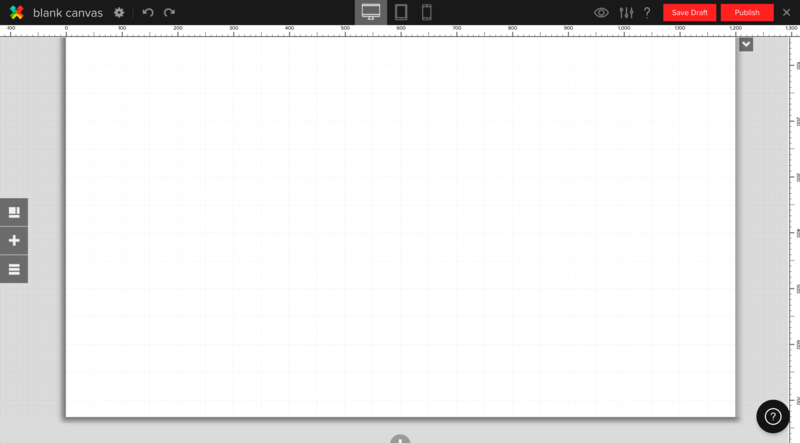 Our drag and drop editor makes it intuitive for anyone to access. 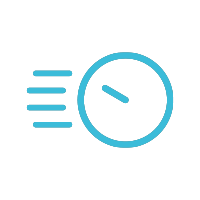 Publish with one click directly to our scalable cloud hosting environment to get changes live in seconds. Save time by sharing sections across your website so updates are synchronised on all pages. Connect Snipcart to your site and get e-commerce in a snap. Add buy buttons anywhere on your site combined with a powerful responsive checkout system. Add custom image galleries into your site. Touch enabled so visitors on mobile devices can easily swipe and explore your images. Add touch enabled slideshows into your page to display many messages and unlike other tools control the way each slide displays on mobile and tablet. Get insight into user behaviour and usage by connecting Google Analytics or any other leading analytic tools. Easily connect your own domain name to Pixel Together to ensure a professional presence. Publish with one click directly to our cloud hosting environment to get changes live in seconds. Mobile friendly, clean semantic code and access to the meta data makes Pixel Together best friends with search engines. Collaborate on your project by pulling in multiple team members with user permissions. Dedicated training and onboarding will ensure your staff get onboard with ease. After-hours email and phone support will ensure your team is supported throughout a project. Contact us for further information including pricing and a free demo.